Base price per 100 ml: 189,07 €. Aloe Barbadensis Leaf Juice (Stabilized* Aloe Vera Gel), Water, Butylene Glycol, Glycerin, Hydroxyethylcellulose, 1,2-Hexanediol, Dextran, Tripeptide-1, Trifluoroacetyl Tripeptide-2, Hydrogenated Starch Hydrolysate, Yeast Extract, Whey Protein, Caprooyl Tetrapeptide-3, Caprylhydroxamic Acid, Caprylyl Glycol, Ethylhexylglycerin, Propanediol, Hydrolyzed Sodium Hyaluronate,Sodium Hyaluronate, Arginine, Potassium Sorbate. This scientifically advanced formula boosts the power of Aloe with a clinically tested ingredient, trifluoracetyl tripepetide-2. In clinical tests this single ingredient significantly improved skin elasticity and is known to combat progerin, a harmful protein that increases as you age and wreaks havoc on your skin. By mimicking natural skin processes, this three-amino acid peptide increases the appearance of firmness and reduces the look of fine lines and wrinkles. That ingredient alone could be its own product, but we didn’t stop there. Paired with hydrolyzed sodium hyaluronate, a natural humectant, to support moisture and skin conditioners, firming serum is scientifically formulated so that Aloe achieves its optimal benefits to soothe and smooth skin. Yeast extract helps support collagen synthesis and natural skin defenses to reduce the appearance of uneven skin tone while whey protein revitalizes the skin by increasing skin’s smoothness, firmness and thickness. This stacked formula is a skin scientist’s dream bolstered with the power of nature and the most advanced laboratory findings to help you look and feel your best. 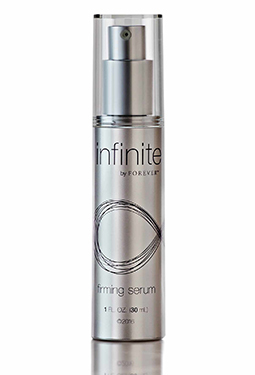 Datasheet : infinite by Forever™ firming serum 555, 30 ml (PDF) -> Open in a new window.